Editor's note: In Context is a new series designed to inform and educate you on Heifer's work in each country we have a presence. Every two weeks we'll tackle a different country and examine unique situations related to hunger and poverty, how Heifer works to address them as well as take some time to explore local culture and traditions. Most of the time, eating local is the way to go. Besides theobvious benefits, like boosting the local economy, it just plain tastes better.Produce is fresher and we get to eat with the seasonstasting fruits andveggies at their peak. 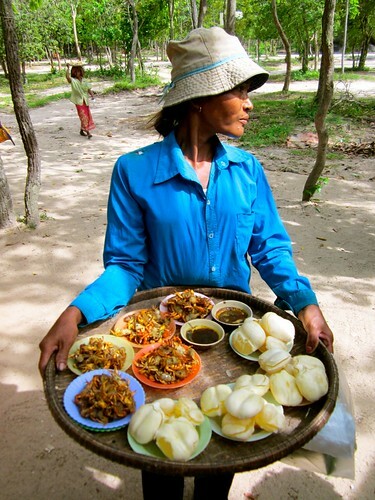 In Cambodia, much of the cuisine is focused on locallygrown, locally produced foods. The Cambodian diet consists of mainly rice and fish although noodles are also popular. Rice, which contributes about 68% of daily caloric intake, is a component of nearly every meal and an essential ingredient in many desserts. Fish makes up 70% of the protein in the Cambodian diet. In fact, fish is so vital to Cambodian culture that the national currency, the riel, is named after a small silver carp that is a dietary staple for many Cambodians. The popular breakfast dish Num Bahn Choc or Cambodian Morning Soup varies in taste according to region and season. This noodle dish is a great example of eating local. Thebasic ingredients to this soupy, rice-y noodle dish are the same: fermentedfish paste, rice and noodles. The rest of the ingredients however, are a combination ofherbs, vegetables and greens available at that mornings market. 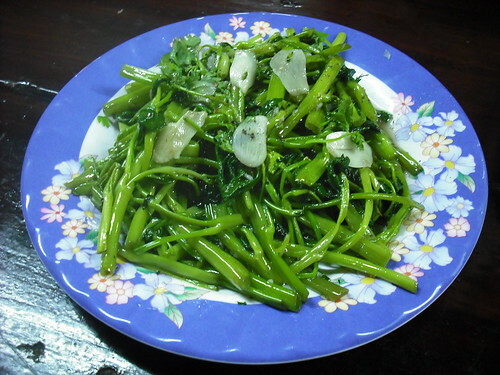 Prahok, a fermented fish paste, which is used in a varietyof ways and is found in nearly every dish. Kroeung is a spice paste made up of star anise, cardamom, cloves, cinnamon, nutmeg, ginger and turmeric. Morning Glory (also known as swamp cabbage or water spinach)is used as a vegetable but is actually an herb. Grows in marshy areas. Tasteslike spinach. Kabocha or Cambodian Pumpkin is a winter squash, broughtto Cambodia by the Japanese in the 1500s. Its sweeter than butternut squashwith a texture thats a cross between pumpkin and sweet potato. Slek Bas or Vine vegetable/Ivy gourd is a leafy green looks like a lot like Morning Glory but tastes like a mix of spinach and watercress.